Winner Winner Chicken Dinner! BrandQuery Wins National Award! We are pleased to announce that BrandQuery, LLC was selected a winner in the 2017 American Graphic Design Awards from Graphic Design USA for best product packaging created on behalf of our client, Skagit Bank. Graphic Design USA sponsors competitions to spotlight areas of excellence and opportunity for creative professionals. This is BrandQuery’s fifth award from Graphic Design USA where agencies from around the country show their work and compete for recognition. Just a shade under 10,000 entries were submitted for this flagship competition that was open to the entire community, including design firms, ad agencies, corporations, non-profits, institutions, freelancers, and students. BrandQuery received this national award for Best Product Packaging: Dollars-in-a-Box. Competition amongst financial institutions is great in Western Washington, particularly the Puget Sound region. Add that to a bank that is strong in Skagit and Whatcom counties but only recently entered the Seattle/King County market. BrandQuery helped Skagit Bank to establish their physical presence in Ballard. We then sat down to work on their community engagement. Many ideas made its way across the table and up on to the whiteboard; the one idea that stuck was the idea of giving a potential business customer money. But how could we do it without just handing them a stack of bills? We went back to our client’s tagline “Genuine Lasting Relationships” and set about discussing how important good relationships are in business banking, in building, growing and managing small businesses. We then identified businesses within a five-mile radius of the Skagit Bank Ballard office and asked bank representatives to approach these businesses to request their inclusion/promotion within the package. Each identified business eagerly embraced the idea. We developed stories for each along with who and how the dollars can be used. We paired the stories with illustrations and created a map identifying each location. Each story along with the map was padded (affixed) in with 15 crisp $1 dollar bills. The dollars can be torn from the pad to spend as the story noted. And, it all was housed in a very simple yet well designed and Skagit Bank branded box. “We are thrilled to have received this recognition for design excellence from an organization that sees the best of the best in graphic design from around the country. 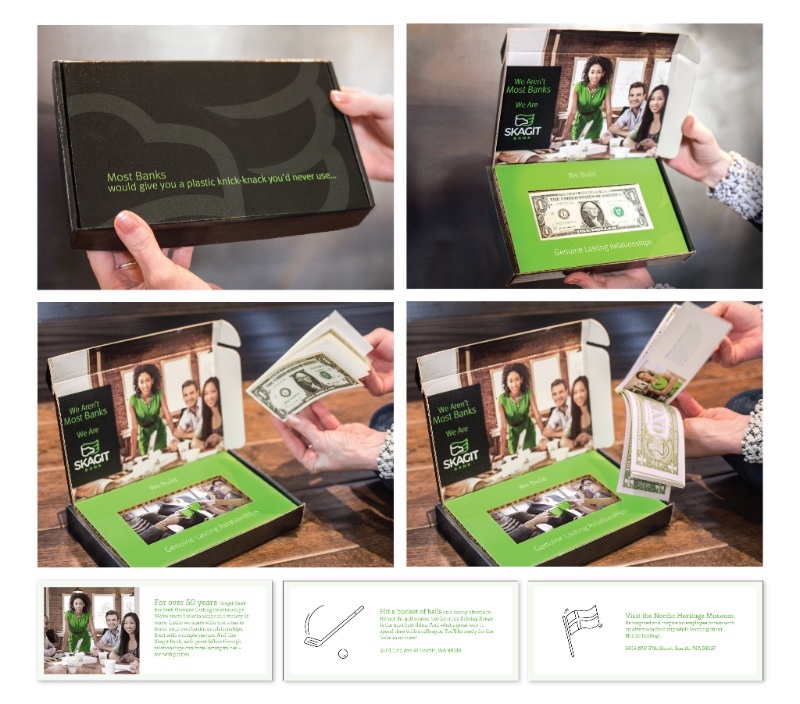 The Dollars in a Box promotional campaign was a fun project for us to conceptualize and implement, ultimately achieving great results for our client, Skagit Bank,” said Jacque Beamer, BrandQuery’s Owner and Chief Brand Strategist.